Chapman Lake is in Spokane County. Chapman Lake, a once-popular trout and kokanee fishery south of Cheney, will remain closed to drive-in public access this season. 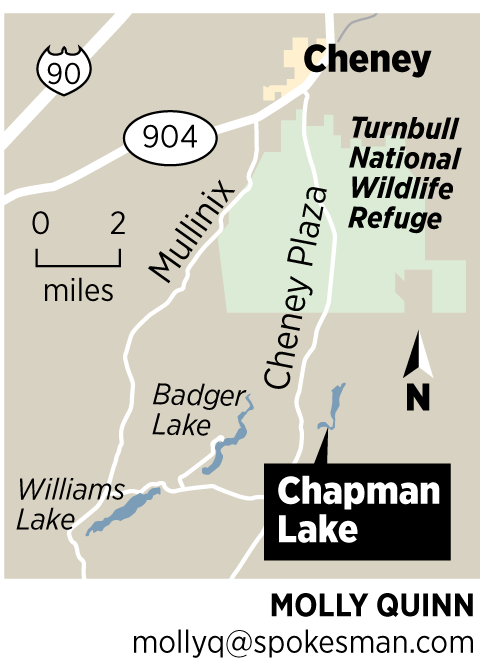 After decades of providing sportsman access, owners of the former Chapman Lake Resort locked the gates in 2011 on the only road access to the lake. The Washington Department of Fish and Wildlife has continued to stock kokanee in the lake on the prospect of being able to develop a public road and access through adjoining state property. Getting the necessary funding and permits has stalled the work. Meanwhile, only the owners of lakeside cabins have been able to get fishing boats onto the lake. The public can access the lake by foot through the Department of Natural Resources property, said Randall Osborne, district fisheries biologist. He said the agency is exploring alternative funding to complete the project. The other kokanee lakes in the Spokane region, such as Deep, Loon, Deer and Pierre, continue to get the number of hatchery fish the biologists estimate they can handle. The state continues to stock the lake with kokanee so it will be ready for sportsmen as soon as access is acquired. “Kokanee populations are different than trout populations,” Osborne said. “There is at least a two-year lag time between when kokanee fry are stocked, and when they grow large enough to be caught by anglers. It is important to maintain consistent kokanee year class strength. One or two missing year classes could result in gaps in the fishery that would be extremely hard, if not impossible, to recover. The state has suspended trout stocking in Chapman. If public access cannot be worked out, kokanee stocking also would be suspended, he said.